Wanna buy a Powerwall 2? Then it may cost you a couple of grand more than it did last week. Only 8 months after increasing the price of the Powerwall 2 in February, Tesla is about to bump it up again. This time by a much heftier amount. 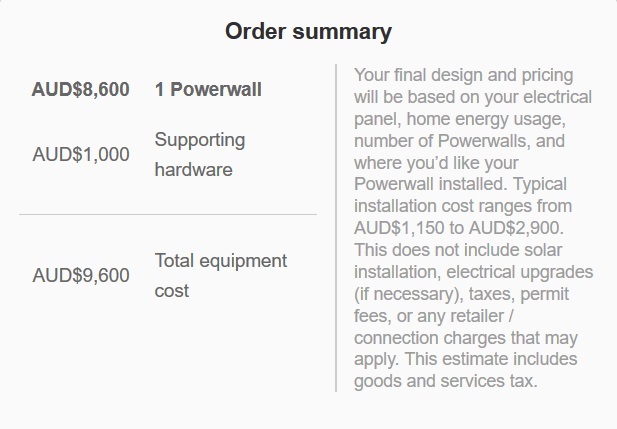 Update 13 October 2018: At the moment the price of the Powerwall 2 is no longer on Tesla’s Australian site. But Tesla has informed me the Australian price of the Powerwall 2 will be $12,350. 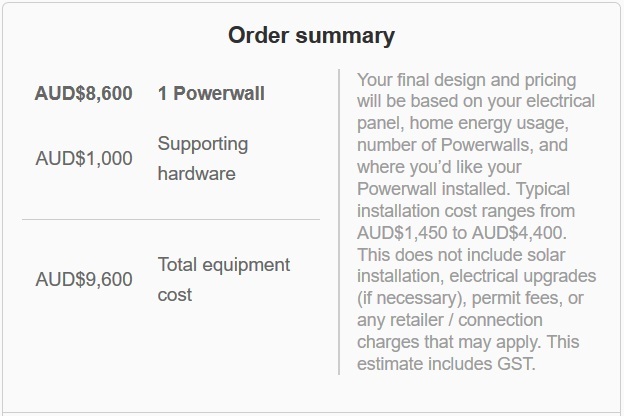 That is $10,100 for the Powerwall 2 plus $2,250 for the other bits and pieces it requires to work. That’s an increase of $2,750 or 29%, which is more than I expected1 Tesla also says the installation cost will be $1,450 to $4,400. If we take the middle figure from that range then an installed Powerwall 2 will set you back $15,275. Tesla says the price increase is global and not timed to take advantage of events in Australia. That would mean it’s a coincidence the Powerwall 2 price rise is happening at the same time battery subsidies are being introduced in their number one market. Tesla has confirmed Australians will have to pay more but are yet to reveal how high the retail price will go. Fortunately, I have a secret sauce (or two) who tell me the wholesale price will increase by between about $1,400 and $1,800 (Tesla seem to have told different customers different prices). After adding GST I expect the retail price will rise by at least $2,000, taking its cost before installation from $9,600 to $11,600 or more. This would be a 21% increase from the current price and a 29% increase from the start of the year. Additionally, at some point in the last 5 months Tesla also raised their installation cost estimate from “$1,150 to $2,900” to “$1,450 to $4,400”. If we compare the middle of those ranges that’s an increase of $900. If the retail price of the Tesla Powerwall 2 turns out to be only $11,600 and we add the mid-range figure from Tesla’s current installation estimate, the final installed cost will be around $14,500. This is the opposite of what is supposed to happen to the cost of batteries. At the same time Tesla has been jacking up Powerwall prices, the cost to make their batteries has been declining. In June Elon Musk, the CEO of Tesla, said their battery cells2 should get down to $1413 per kilowatt-hour by the end of this year. As Tesla said their batteries were “under $268” in April 2016, that’s close to a 50% decrease in under 3 years. As Powerwalls aren’t available at the moment, this means by the time you get your hands on one the 14 kilowatt-hours of battery cells inside it will cost Tesla less than $2,000 for a system that is likely to cost over $14,500 installed. Battery cells are required for Tesla’s electric cars. The Australian dollar is down. I’ll explain why I think these explanations are either incorrect or don’t justify the whole increase. My best guess for the reason behind the Powerwall price hike is that Tesla is taking advantage of the South Australian battery subsidy starting this month and the Victorian battery subsidy that may begin next year. The latest price increase hasn’t been added yet, but you can see Tesla substantially increased their estimated Powerwall installation price. If you want to give that a positive spin I suppose you could say rather than being a price increase they were merely adjusting their estimate to better reflect reality. One explanation I’ve seen given for the price increase is Tesla needs to put all their effort into producing their Model 3 electric car. To me this makes no sense at all. So far Tesla has produced around 100,000 fewer Model 3 cars than they originally said they would, so there should be no shortage of battery cells. Not unless they never had the ability to produce cells for that many cars. But let’s say that, for whatever reason, Tesla’s supply of battery cells was constrained and they decided it was more important to put them in their cars than in Powerwalls. This in no way requires them to increase the price of the Powerwall 2. They could instead simply make Powerwalls unavailable until their cell production increases. They’re already unavailable in Australia until at least early next year. If they instead decide to make Powerwalls available but at a higher price then that is a deliberate choice by the company to charge more money per unit and not something they are forced into doing by a lack of battery cells. After all, the cost of manufacturing the cells shouldn’t have gone up. The Australian Dollar Is Down? Back in February when Tesla first hiked the cost of the Powerwall 2 for the first time this year the Australian dollar was worth around 79 US cents compared to 71 cents today. That’s a decline of 10%4. If the Tesla Powerwall 2 increases by the $1,800 one of my secret sources reported (plus GST), then its price will raise by 20%. So the fall in the Australian dollar explains half that price increase and currency fluctuations are something Telsa should have already been prepared for. After all, there’s a reason why there are kangaroos on our dollar coin. Another excuse for the price increase is that lithium prices are up. This excuse was thrown at the wall and managed to bounce off and hurt my head because lithium prices are the opposite of up. They are down. I’m not saying lithium prices are so down they should be prescribed lithium to cheer them up, it’s only a fall of around 8% since since the Tesla Powerwall’s last price increase in February, but down is still infinitely less up than up. While Tesla Powerwall battery cells require both lithium and cobalt, the cost of these elements only make up a tiny portion of the total cost of a Powerwall 2 and so their price fluctuations only have a minor effect on the cost of producing it. Last Thursday I spoke to a Tesla representative at the All Energy Expo in Melbourne. He didn’t seem aware of the upcoming price increase, or the estimated installation cost on their website, or that Tesla has said Powerwalls won’t be available in Australia until “early next year”. In his defence, he appeared to be about 16 years old and I blame his masters for not giving him correct information. But it is a worry when people wearing the Tesla T-shirt know so little about the price and availability of their company’s products. 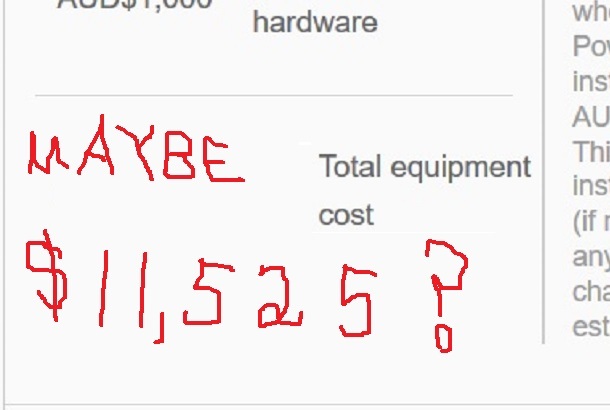 They confirmed the Powerwall price was going up but they didn’t know by how much. When I told them the price hadn’t been increased on their website they were surprised but said they would honour the current price for anyone who puts down a deposit. When asked about their estimated installation cost they said the lower end was inaccurate and would be adjusted. I’m pretty sure they meant adjusted upwards. When I asked why the price was increasing I was told that the exchange rate was one reason and the company needed to stay in business was another. When I asked when would be the earliest time Tesla Powerwall will be available again, I was told November. Given what Tesla has said previously and what various secret sauces have told me I think that is way too optimistic. 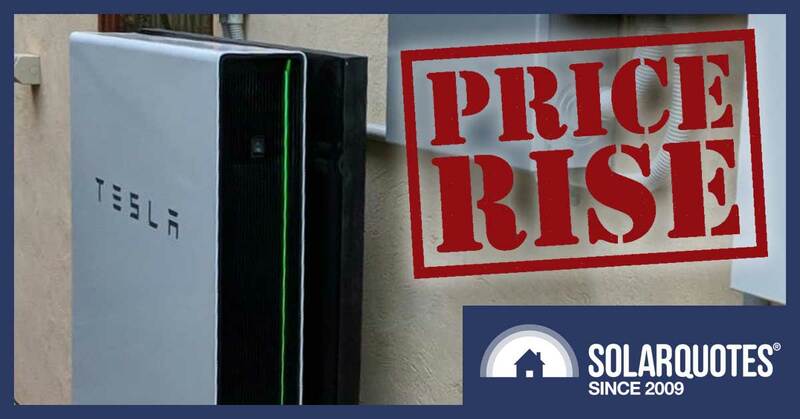 If you are absolutely certain you want to order a Tesla Powerwall 2 and are either not eligible or not interested in receiving a subsidy, do it now before the price increase goes through on their website. But if you’re not 99.9% sure, my advice is not to rush into it. While the Powerwall price is going up the general trend is for the cost of batteries to fall so if you wait they will get cheaper. I personally believe the main reason Tesla is raising the price of the Powerwall 2 is to take advantage of the battery subsidy offered by the South Australian Government and one that may be available in Victoria next year. I’m not a fan of battery subsidies because at the moment home battery storage increases greenhouse gas emissions. But if we are going to have them the subsidy money should be used to put batteries in people’s homes and not put extra money in battery manufacturers’ bank accounts. So I suggest the South Australian Government take action against any battery manufacturer that has raised their prices since the start of this financial year. Battery manufacturers that increase their prices could be banned from receiving any subsidy, but this seems a little harsh to me. Instead the amount of subsidy received could be reduced by an amount equal to the price increase. This should discourage battery manufacturers from hiking prices unless they have no choice. Allowances can even be made for changes in exchange rates. Just so long as prices come down if the exchange rate improves. If the South Australian Government doesn’t act, other battery manufacturers may raise their prices and eliminate much of the benefit of the subsidy for South Australians. But the real losers will be people in other states who will have to pay more for batteries without receiving the benefit of a subsidy. Morning Ronald, OH NO, IT’S ME AGAIN. LOL. There is much better options out there than pw2. Tesla can increase them as much as they like, It’s only going to hurt them at the end. I have been using both tesla pw1 and lg resu batteries for the last 2-3 years, lg batteries are much cheaper, smaller, no noise and their charge seems to last longer on a 24 hour basis. Obviously there is other players in the industry, but, I can only comment on my personal experience. Have a great day everyone.!!! I note you said batteries, plural. Most households contemplating off grid capability would probably need two Redflow batteries to get peak supply and to cover downtime for the Monthly? internal maintenance. In any event, I’d want a very good discount for two, or forget the second one. I have heard suggestions that a secondary (non redflow) battery to cover the maintenance cycle for a couple of hours is an option. My concerns were about peak output which from memory is 3kW. We seldom get there but it does seem a little on the low side. If Tesla and Co are looking at 12k including installation the Redflow is in the ballpark. I think I’d finish the maintenance discharge early in the morning, e.g. by running dishwasher, washing machine, and aircon, etc. The PV array should then power all loads during the recharge, obviating any need for a fill-in battery, I’d hope. As ZBM2/Z-Cell charging must be limited to 2.5 kW (44A @ 57v) as I understand it, a 6 kW array should have reserve for all of that in sunnier months. My mental model is that a second flow battery would only be useful for extra grey-days capacity. 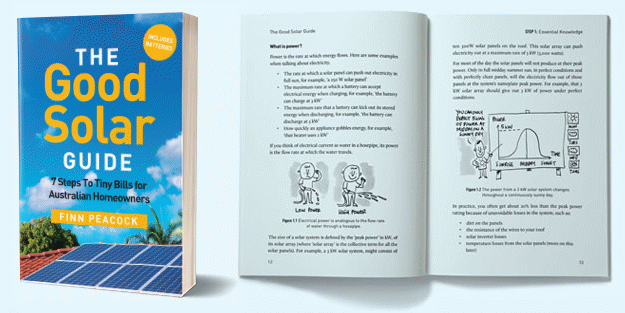 Admittedly, in the depths of winter, with only one flow battery, you’d have to pounce on a sunny day if it came along a bit before a maintenence cycle was due – or run the generator for a bit if you missed. My notes show “Output power: 3 kW (5 kW peak) Operating the ZBM at a higher level will void any warranty claim.” It is difficult to imagine how I could usefully consume more than that at night or on a deeply clouded day, for something which could not possibly wait until morning or for the clouds to pass. The Z-cell, with its fancy consumer-friendly enclosure, is significantly more expensive than the naked ZBM2, but that is not so much targeted at consumers. I reckon the increase is to help Elon pay his fine. I also agree with Tim. If Tesla keeps this up they will be seen as gouging the public when battery prices are expected to be on the way down. Negative publicity and people will seek out alternatives. Speaking of alternatives I saw a Youtube video the other day that showed a guy who built his own “Tesla” 4.4 kwh powerwall for $ 300 USD using 18650 batteries. Here’s the link for those interested. I wouldn’t be game to try but it leaves a nice little niche market for those that are technically endowed. Maybe you could crank a few out on your weekends off Ronald ? I would definitely not buy a Powerwall from Jehugarcia… he hacks things left right and centre with very little regard to the consequences. Plenty of other builders doing it a lot more safely. What if they gave an election and nobody came?? (of even got moderately excited?)…. They’d tart it up and tout it as ‘spcial’, different, desirable! The idiots who vote for politicians, pay $1,600,000 for a (local) shack I personally could build for under $20,000 (and I speak as someone who helped build the weatherboard humpies 50 years ago) and who pay spiralling prices for LPG when the Chinese pay 1/16th the price for OUR gas! ~ those are the same dills who can’t live without the latest in gee-whiz batteries, and will do anything, pay any manure-fed price so as not to miss out. The better lead-acid batteries (amg, etc.) do it at least as well and cost a fraction of he price. And not only are you in total control of your system, anyone with any horse-sense will find a number of of uses for the carcases of dead batteries. Talk to your nag Young Ron. Ronald – I make 8c off 79c just over 10% – is your calculator broken? Actually it might be my brain that is broken. Not sure how I got that wrong but thanks for pointing out my mistake. I have corrected the article and put in a footnote mentioning my mistake. ps. The MAIN reason the price-game continues to ” justify the whole increase.” is because the bunnies are willing to pay the price. The rest of it is waffle. The fourth possibility is that the extra gubbins to enable islanding is the reason for the price increase. Either way, I’m set up at a rental (maybe future abode) to take an LG Chem which originally was an additional $5k if I added it to the system I had installed including hybrid inverter and off grid box. Mysteriously the gumtree ad for the LG Chem price jumped by $1000 soon after the SA rebate was announced. Funny that. In hindsight, ToU pricing with a realistic peak time and price signal might have been a better way to encourage BTM storage. The existing gateway provides islanding and works perfectly. They have no need to upgrade the gateway that I can see. So I can’t see any justification for doubling the price of the gateway. Me thinks you are over thinking it. It’s simply supply and demand. When one goes up the other goes down. Tesla currently can’t make enough batteries to satiate current Oz demand. That’s without subsidies, customers being told batteries make no economic sense yet and you mention they also increase green house emissions? They are a product of negative value and no end of people who want one. Of course Tesla is going to Jack up it’s prices. Just how does this reverse subsidy penalty work? Government announced subsidy. Creates beauracracy to record current price of entire market offering? Tesla announces it is retiring power wall 2 and a new product called mega floor is now for sale. $2000 more expensive than 2. Maybe they are putting something aside for warranty support ? None of the costings on retail battery prices have an adequate provision for future warranty work except perhaps Sonnen and Fronius Sony batteries. Also, the install rates have gone up because really, it does actually take a long time to re-configure the board for private meters eg CT based energy meters and in some cases thru-current type meters. It really was an optimistic cost in SYD / MEL. Mondo I was only sharing the concept not recommending we buy one from him. There’s always one in a forum or blog who likes to show off his “knowledge” to us lesser mortals isn’t there ? As a suggestion maybe you could put some links down and share your knowledge instead of just “knocking” what others do ? Hi Adam – I wasn’t knocking you just warning you and others on the forum. I too was initially sucked in as he’s a good presenter with reasonably high production values (he used to sell 35mm video adapters – see JAG35). But then I saw a solar / battery install where he managed to set fire to someone’s motorhome, he’s recommended and provided links to fake batteries, he’s tried to hack old UPS’s (unsuccessfully) – on the plus side he has made some good videos but generally when someone with more technical knowledge is involved. My concern is his lack of knowledge sometimes leads him to do unsafe things – hence the warning. On the other hand the two below might make the odd mistake but for example HBPowerwall always gets all his electrical work done by an electrician which is code in Australia. Ok Mondo – apologies and thanks for the links. It will be an interesting area to watch if someone can safely produce a Powerwall equivalent for a fraction of Mr Musk’s offering. 1) Battery storage at a reasonable cost now seems even more distant than it did before. Maybe in 5 years time we’ll have enough trained installers and sufficient standardization of both inverters, battery storage and their mutual coupling systems to make the whole exercise economically viable and relatively ‘hassle free’. That said, I’m not really sure I’ll need a battery anyway by then. Once you shift most of your meal cooking requirements, laundry, and dishwasher usage to the daytime, install energy efficient lighting and TV’s, well.. you’ve made a noticeable dent in night-time kwh consumption already. Once you get your night-time consumption down, then ‘low tech’ solutions that don’t require anything like a (say) $50,000 outlay on battery storage start to make more sense, even if they are not quite so ‘convenient’. 2) There is a ‘hidden obstacle’ to the introduction of electric powered vehicles. The maintenance and construction of road highways are all significantly dependent on fossil fuel excise. Currently the retail price of petrol includes 40.9 cents excise plus 12.5 cents GST. which goes to the Federal Government and is intended to cover those costs. Roughly 75% of that excise revenue goes into ‘General Revenue’ with only 25% of it being allocated to Road funding. That’s been a sore point between State and Federal governments for years. That excise flow of course begins to disappear as the number of electric vehicles steadily increase. In fact its been in decline for some years already, due to more fuel efficient vehicles, the introduction of hybrids, and because individuals are tending to cut back on non-essential vehicle usage. As well, the price per litre continues to rise due to CPI indexation, along with ‘price shocks’ because of a variety of international events and natural disasters. The issue is – the Government will have to replace the approx $10 billion total it now gets from Fuel excise with something else. I’m not aware of any action on that front by Government …. YET. What I’m implying is that the combined capital and running cost outlays for an electric vehicle may well end up being a lot more than we expect, especially if you factor in some unknown amount for periodic battery replacement. Fortunately there are huge health benefits from eliminating infernal combustion engines from our roads. Longer lives and fewer sick days are worth a lot along with the general improvement in the quality of life. I think we should consider the majority of the fuel excise that goes into general revenue as petrol and diesel paying for their health externalities. Whoa! Tesla has released their new Australian Pricing. You can scratch you $11525 and put in $12350…..
$12350 up from $9600 (total cost without install), so that’s $2750 for base cost increase (without install costs increase). Taking it up to $13800 min to $17750 max…. Wow! Typo, Should be $16750 max, not $17750. Blame Windows Calc for that! Nice. I paid $11400. Glad I did. as much as I want to love redflow batteries, look at the electrolyte and how toxic that is, and imagine even a faction of that spilling into a waterway, contamination from then forever. your grandchildren still wont be able to drink water out of that waterway. if your place burns down, fair change of electorlite leak. Yes “look at the electrolyte and how toxic that [Zinc Bromide] is” is good advice. And the first look shows “Safety considerations are similar to those for zinc chloride, for which the toxic dose for humans is 3–5 g.” That is significantly more toxic than common table salt, which we consume every day, but a cupful of waterway-diluted spillage doesn’t seem as deadly as if a highly toxic chemical were involved. I’m pretty sure that 5g of anhydrous sulphuric acid (dehydrated battery acid) would be deadly. As for “forever”, that is only true for _extremely_ short values of “forever”, as Zinc Bromide is highly soluble (water will dissolve 4.47 times its own weight of ZbBr, for heavens sake), and it will leach out and flush downstream as soon as it rains. Not real good for fish for an interval, but better than an equivalent volume of battery acid, I figure. However, an environmentally aware installer would have used a commercial bunding trough, so that we don’t even suffer a stain on the garage’s concrete floor in the event of a battery leak. Granted, a bund is often made of thick plastic, so the fire scenario could have that burning – and then the watery electrolyte would help extinguish the fire. (As opposed to common lithium electrolytes, which fuel the fire.) If either of us were serious, we’d check whether the metal Z-Cell enclosure incorporates a fire-resistant bund, rendering all leakage scenarios moot. If you buy Tesla you buy for your ego and prestige. We have installed LG Chem 9.8kwh for under $7000 and BYD B-Box Pro 10kwh for $7200. I now prefer the BYD batteries, perfect for off-grid, too.